Polad Bulbuloghlu (1945- ) was once as big as the Beatles - at least in the former Soviet Union. While he never claimed to be "bigger than God" as they did, he was very popular and received invitations to perform across the Soviet Union and in Prague, Havana, Turkey, Lisbon, Baghdad and Mexico. This was a rare privilege during the Soviet period, since few people had the chance to travel abroad. Today, Polad has taken on a more political role in Azerbaijan, serving as the country's Minister of Culture for the past decade. While he has no plans to leave public office, Polad recently embarked on a new venture - his musical comeback." 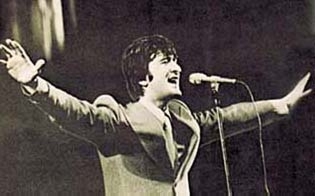 Left: Polad Bulbuloghlu, Azerbaijan's Minister of Culture, was once one of the Soviet Union's most famous pop singers. One of Polad's most famous songs is (Come, Morning), first recorded in 1968. The song, which he composed himself, is based on a poem by Fikrat Goja. [For other examples of Goja's work, see AI 7.4, Winter 1999.] It was especially popular in the late 1960s and early 1970s and helped launch Polad's career as a pop star. When he decided to return to the recording studio last year, a modernized update of this favorite was a logical choice. Four different versions of appear on Polad's new CD. In the first track, Polad sings a remake arranged by Paul Buckmaster, a British composer who writes for pop singers like Elton John and David Bowie. Next is a Turkish version of the song performed by Turkish singer Fatih Erkoch. For the third selection, Polad sings the song as an Azeri-Turkish duet with Turkish singer Shebnem Ferah. Polad's original 1968 recording rounds out the CD. The music video for the song features picturesque camera shots that pan over two classic Azerbaijani scenes: the Caspian Sea and the ancient rock petroglyphs at Gobustan. A Turkish film company gave the video its special effects and professional quality. Polad's video is now often shown on morning shows on Azerbaijani TV. Polad is also known as the son of Bulbul (Murtuza Mammadov) (1897-1961), one of Azerbaijan's most famous opera singers who was given the nickname "Bulbul" from the Azeri word for "nightingale", which is considered the sweetest of all bird songsters. In fact, Polad got his start as a performer as a teenager while touring with his father. Polad's next recording project, done with Siyavush Karimi, features new arrangements of Bulbul's repertoire. The recording has been completed and a new CD is scheduled to be released soon. To purchase a copy of the CD, contact Polad via email at mugam@culture.gov.az. Music from the CD will also be available on the AI web site in Summer 2000. Click on "Music Section". Everywhere is as dark as those eyes. Where do these roads take you? The world will start another new tale. Wake up, Sun, wake up. Or it will run away in one dark night. And bring back the life that has passed.